Clive Palmer – Renewable Energy’s Saviour? Renewable energy is not something that springs to mind when I think of Clive Palmer. Loudmouth Imbecile? Yes. Bizarrely entertaining lunatic? Yes. Environmentally insensitive coal-mining magnate? Yes. But Palmer United Party’s controversial leader has spoken out in support of renewable energy and against government plans to review Australia’s Renewable Energy Target. What’s this, you say? 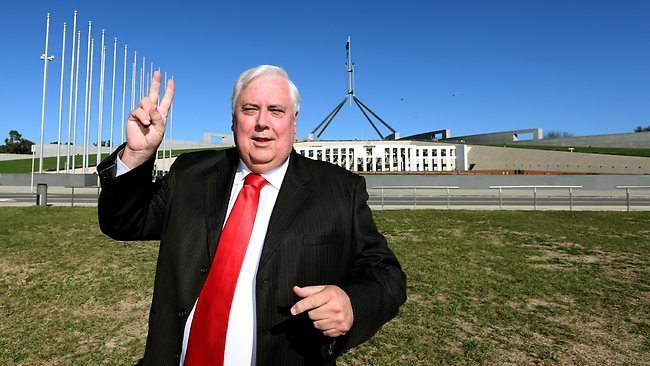 The same Clive Palmer who plans to develop a $6.4 billion coal mine in Queensland’s Galilee Basin which, when burned, will release so much CO2 that it will cancel out any savings from Australia’s emissions reduction target? Your eyes have not deceived you. Clive cares. Yesterday, lead WA PUP candidate Zhenya ‘Dio’ Wang endorsed Australia’s existing 20% Renewable Energy Target, describing the proposed review as a ”waste of taxpayers’ money”. Wang stressed the importance of leaving behind a sound environment, for future Australians to enjoy as we do today. Clearly, he hasn’t heard about his boss’ nickel refinery leaking toxic waste onto the Great Barrier Reef or destruction of the Bimblebox Nature Refuge. Crucially, Wang noted that the solar industry in Western Australia employs more people than the oil, gas and coal industries combined. Again, I’m not sure if Wang has thought about where his salary comes from… it sure ain’t from energy of the renewable variety. Wang will be battling it out for a seat in the upcoming WA Senate election with standing Greens Senator Scott Ludlam. Ludlam and his party have always opposed a review of the RET and any steps backwards on climate change. He a staunch supporter of the renewable energy industry and the employment benefits it will bring to WA, offsetting the losses when the mining boom inevitably collapses. There is widespread support in WA for the expansion of solar power in the state and the long term economic benefits it will bring. Ludlam also has great hair, which just can’t be said for Wang. So I’m going to remain sceptical of Clive’s noble intentions to save planet earth from the evils of fossil fuels. My guess is that it’s another well timed publicity stunt that Clive does so well, a last ditch attempt to swing WA votes in the direction of the PUP. Palmer has refused to say if the PUP would use its influence on the balance of power to block any proposal to repeal the RET, adding further fuel to my scepticism.